Given the auspicious nature of Friday, the 13th, how about we start the Easy-Bake Oven version of bioreactors? (insert evil genius laugh). Our report this week is rich in biosafety, GMU Open Houses, and updates on global outbreaks. Fun History Fact Friday – this week in 1989, the Berlin Wall came down! Before we venture down the rabbit hole, don’t forget to get your flu shot before the 2015/2016 influenza season hits too hard! Make sure to swing by our GMU Master’s Open House on Wednesday, November 18th at 6:30pm to learn about all our different programs! Good news – you can virtually attend via this link and even ask questions live! 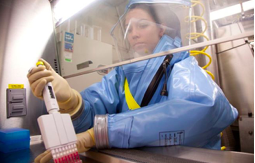 We’ll be talking biodefense and all the ways you can use our MS degree (online or in person!). Whether its fighting food safety issues, pandemic influenza, or zombies, we’re passionately trying to make the world of global health security stronger and more diverse! “Biology must move forward on safety and security. Let’s not reinvent the wheel, but learn from those doing safety better.” Tim Trevan’s comments echo the sentiments of many within the biosecurity field. The anthrax mishaps at Dugway and the CDC BSL-3 lab in Atlanta compound a growing concern over the handling of select agents and the lab safety practices and processes that seem to be failing. Trevan poses the question, “what are the prospects for managing the more intractable risks globally if measures to ensure the safe handling of dangerous pathogens are failing at the best-equipped facilities in the country with the most advanced biotechnology in the world?” In his words, Trevan has hit the nail on the head and summarized the realities of lab safety culture. So what’s to be done? Trevan makes the unexpected recommendation of using nuclear security experts to advise on biosafety and biosecurity. This strategy utilizes a practice that is also common in healthcare – a culture of safety. By focussing on the prevention of failure, instead of maximizing output, safety becomes an engrained practice in all levels of an organization, transforming it into a “high-reliability organization” (HRO). By using examples within industries like offshore oil drilling, airlines, etc., Trevan points to the growing biotech capabilities that make biosecurity that much more imperative. In healthcare, I’ve seen organizations truly transform their practices by moving to a culture of safety (and utilizing “just culture” when it comes to patient safety) and while it’s not a wholly easy process, the foundations are already present in the existing teachings of patient care. Labs have the training and knowledge for safety, but as Trevan points out, it’s time to bring in those with the expertise to help move towards a culture of safety. If you’re considering a winter retreat to Hawaii, make sure to grab some bug spray. Hawaii Island is currently experiencing a Dengue outbreak that has just reached 33 cases. Dengue is not endemic to Hawaii and while travelers have imported cases from time to time, this is marks the first big cluster of locally-acquired cases since 2011. 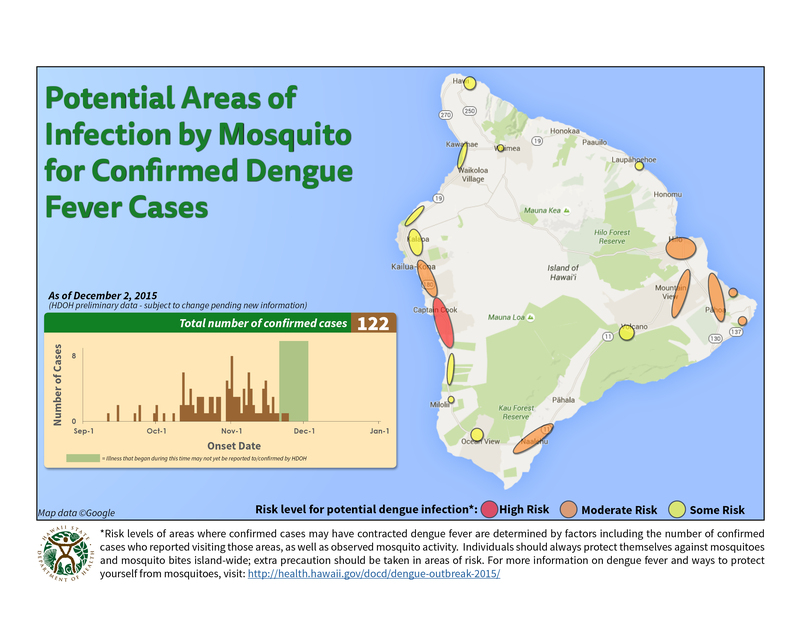 The Hawaii Department of Health (HDOH) continues investigations and reports (as of 11/11) 25 Hawaii Island residents and 8 visitors have been laboratory confirmed with dengue fever. The HDOH has provided maps related to exposure areas to help people avoid high-risk locations or at least use preventative measures. If you’re traveling to Hawaii Island or an area where dengue is endemic, make sure to take steps to reduce the risk of mosquito bites and the potential for transmission! Guinea has reported no new cases in the last week. While they’re still on high alert after the cases surrounding a family, they are hopeful. Liberia and Sierra Leone have hit their 90-day enhanced surveillance period, meaning they have no new cases and are now working towards the WHO’s second objective (managing and responding to residual risks). Pauline Cafferkey has made a full recovery after her hospitalizations due to post-Ebola recovery complications. Researchers at Columbia University’s Mailman School of Public Health used a new statistical model to map the outbreak. 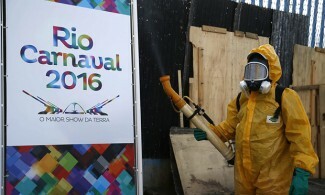 Results will be published in the Journal of Royal Society Interface, which shows the development of the outbreak and role early detection and response plays. Joint Services Mask Leakage Tester (JSMLT) Contract – the DoD has announced that Air Techniques International, Inc. has been awarded a contract regarding the maintenance of the JSMLT. The JSMLT does quality control and ensures proper fitting (portably) on CBRN protective masks. H7N9 Cases in China Rise– China has confirmed two more cases that occurred in October, bringing the total case count to four. Many in public health are noting that these cases bring about a fourth wave of infections (starting in October). The two new cases were a a 62-year-old woman from Shengzhou and a 51-year-old farmer from Hangzhou. Boosting Biosecurity in Nigeria & Kenya– The Institute of Human Virology at the University of Maryland have announced two grants to help build biosecurity in Nigeria and Kenya. The first grant of $13 million will go to strengthen laboratory infrastructure in Kenya, and the second of $10 million will help those in Nigeria quickly detect and respond to emerging infectious diseases. It looks like the blog isn’t the only place with a lull during the summer. This week was oddly slow for news; maybe it’s an August thing? For our top stories we’ve got ISIS with chemical weapons and, from our neighbor to the north, a disease diagnosing fabric. We’ve even got a few stories you may have missed. The U.S. is investigating what it believes are credible reports that ISIS fighters used mustard agent against Kurdish Peshmerga fighters in Makhmour in Northern Iraq. ISIS posted about the attack on social media, but American officials have stated they have independent information that left them believing that a chemical weapon was used. A German Ministry of Defense spokesman echoed that they cannot confirm or rule out that a chemical weapons attack occurred. The major question for U.S. officials is to determine if it was mustard gas, and if so, how ISIS came to possess it. Yes, you read that right. Christa Brosseau, an analytical chemist at Saint Mary’s University in Halifax, Nova Scotia, is working on the development of a chemical sensor which can be built into fabric and can detect diseases like tuberculosis, malaria, and HIV/AIDS. How is this even possible? First the scientists make Nanoparticles, then aggregate those particles which ends up as a silver Nanoparticle paste. That paste can be placed on a fabric chip and it then ready to use. The fabric chip interacts with bodily fluids like sweat, saliva, or urine, and is then scanned for information. CTV—“The technology picks up disease biomarkers and the scientists are able to get results in approximately 30 seconds, by using hand held units, the size of a TV remote control, to scan the samples. The size of the units makes them convenient for working in the field. Outbreaks of dengue fever, typhoid, and malaria that have plagued Yemen recently are caused by uncollected garbage on streets across the country. According to Mercy Corps, garbage has contaminated the soil and water and has led to the proliferation of pests—including mosquitoes—which breed and lay their eggs in standing water. A homeless shelter in downtown Atlanta, GA, appears to be ground zero for an outbreak of tuberculosis in Fulton County. In consultation with state health officials and the CDC—also housed in Atlanta—the mayor’s office has decided to close the shelter. Human bones found along a highway in Schuylkill Haven, PA, are believed to be from “impoverished victims” of the 1918 Spanish Flu pandemic. In Schuylkill County, the local newspaper reported that 17,000 residents came down with the flu and several thousand died. This week, the CDC released a new video demonstrating how antibiotic-resistant germs are spreading between healthcare facilities—even those that are practicing infection control and antibiotic stewardship. 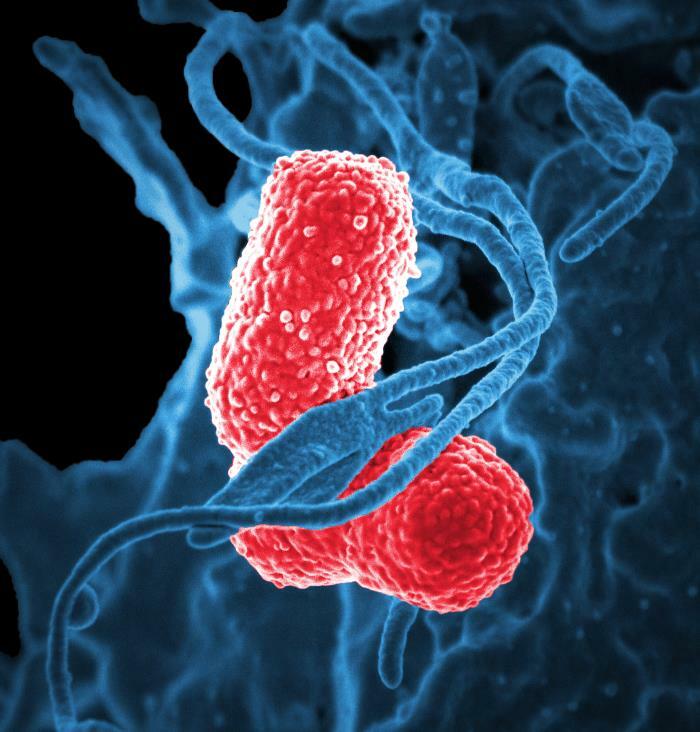 These resistant germs cause over 2 million illnesses and at least 23,000 deaths annually in the United States. We are introducing a new feature for the news round up—“Stories You May Have Missed.” This final section consists of fascinating articles I’ve found throughout the week that couldn’t fit in the report. This week the round up includes the UN Security Council’s resolution about Ebola, ISIS using chemical weapons in Iraq, a surprising source to combat antibiotic resistance, and of course, an Ebola update. Lastly, you know what time of year it is, flu season is starting…don’t forget to get your flu shot! On Thursday, the United Nations Security Council met to discuss the Ebola outbreak in West Africa and unanimously adopted resolution 2177 (2014). 2177 established the United Nations Mission for Ebola Emergency Response (UNMEER) and calls on Liberia, Sierra Leone, and Guinea to speed up establishment of national mechanisms to deal with this outbreak and to coordinate efficient utilization of international assistance, including health workers and relief supplies. The resolution also calls on other countries to lift their border and travel restrictions saying that isolation of the affected countries could undermine efforts to respond to the outbreak. There were reports this week that the IS terrorist group has used chemical weapons in an attack on the Iraqi army in Saladin province. The reported attack took place Wednesday and Thursday in Dhuluiya, which has been under control of the group for more than two months. The attack affected approximately a dozen people. It was a terrible week for Ebola, absolutely terrible. Above, we already learned that the UN Security Council declared the virus a threat to international peace and security, but that wasn’t all that happened. President Obama pledged 3,000 troops to fight Ebola in West Africa. The WHO said that the number of Ebola cases could begin doubling every three weeks and expressed concern about the black market trade of Ebola survivors’ blood. Eight aid workers and journalists were murdered in Guinea leaving many to fear that violence could stymy relief efforts and in Sierra Leone, the government instituted a three-day lockdown in order to help health care workers find and isolate patients. One of my favorite singers, Colin Meloy, posted this story on his facebook. Wealthy L.A. Schools’ Vaccination Rates are as Low as South Sudan’s. I read an interesting opinion piece related to the Dengue Fever outbreak in Japan. Dengue Fever and the Shibuya Apple Store. Travel season for my students is over, so while I wont be at Dulles anymore to check the CDC Travel Alerts, CNN did it for me this week. Going Abroad? Here are 10 diseases you need to watch out for. In an effort to combat the spread of hospital-acquired infections, the Washington Post had an interesting story this week: Hospitals of the Future could be Covered in Shark Skin. For those classical music fans out there, Medical experts say composer Frederic Chopin’s preserved heart bears signs of tuberculosis.